For over 30 years we’ve celebrated the log home lifestyle. While true to our roots, we’ve developed the world’s most technologically advanced log home system. Our technology is comprised of many details and it’s our attention to these details that create the peace of mind that we provide our customers. 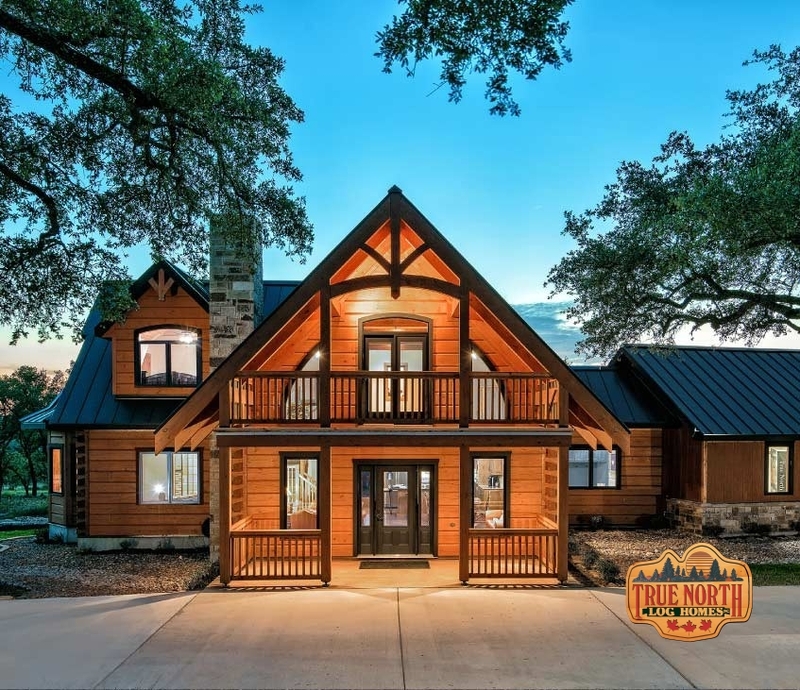 True North Log Homes manufactures the best-engineered log homes in the world—homes of exceptional quality, beauty, and durability. 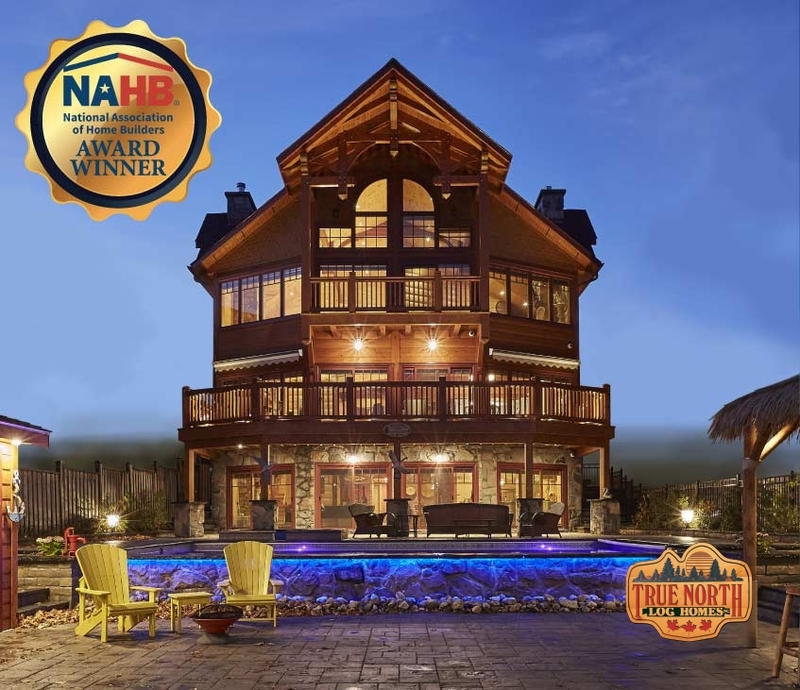 Through our untiring dedication to excellence, we’ve brought True North to the forefront of log home technology and design—supported by 22 Canadian and US patents and over 32 years of experience in the log home industry. Our patented systems are widely acclaimed, with thousands of homes built throughout Canada, across the United States of America, and in Great Britain, Ireland, Germany, Mexico, South Korea, the Bahamas, and Japan. This custom bungalow provides everything you need for relaxing, working or entertaining friends. Come home to True North’s flagship home—a designer showcase with many innovative design features. This home is so warming and relaxing inside. You immediately feel the calming effect of the natural logs. 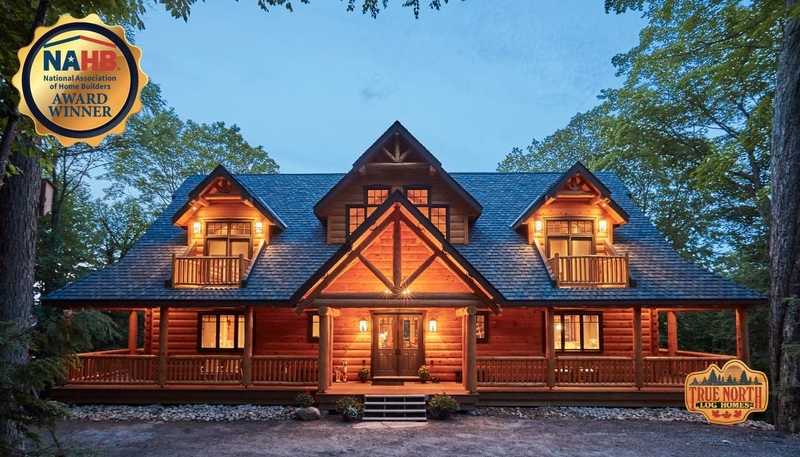 The ultimate custom log home for maximum relaxation and leisure. Imagine yourself relaxing on the porch, coffee and newspaper in hand, overlooking a pristine lake! Experience “Luxury That’s a Cut Above”. Learn about the advantages and advanced technologies that separate a True North Log Home from all others. Stay up to date with True North Log Homes via e-mail with our free e-mail newsletter, which provides free log home tips, special offers and more. 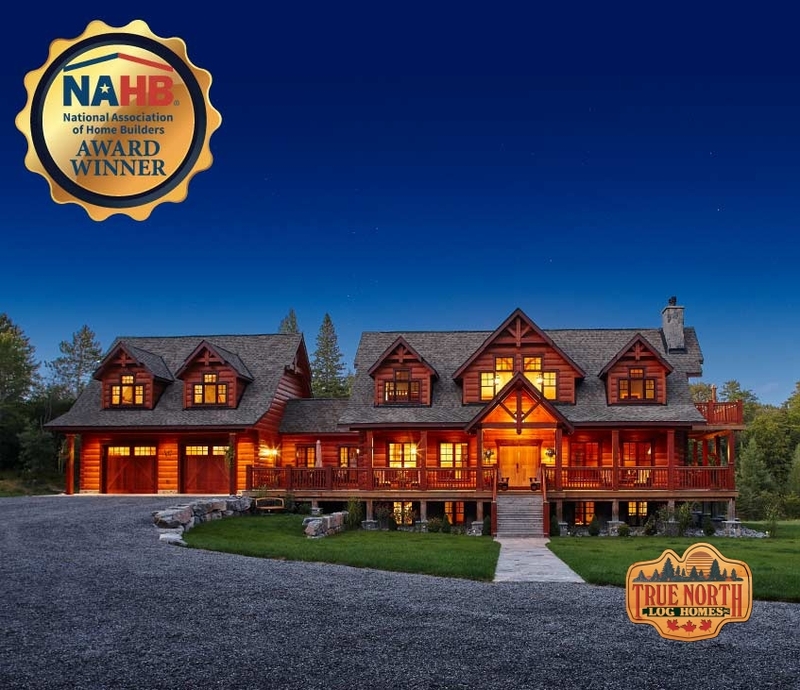 "True North Log Homes should be proud of the professionalism, courtesy and values that are shared by all. The seminar was well organized, informational and very helpful on obtaining facts in the decision process and I would highly recommend and suggest prospective customers attend. Please thank your staff and wife for hosting a most wonderful experience." "If you have ever dreamed about a log home — owning one is a thousand times better! Working with True North’s designers and engineers was a wonderful experience — they made our dreams a reality. Guests are amazed at our home’s design, especially the ‘Kingpost’ technology used to support the roof." "This is the log home for anyone who appreciates perfection! If you can’t find the perfect home – then build the perfect home. 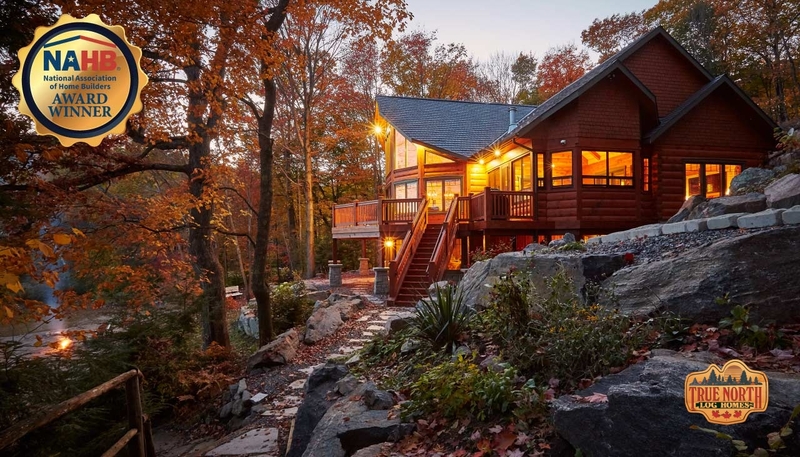 It’s hard to find a log home that combines elegance, warmth and personality. True North made this a home we love to come home to!" "We are living in our own masterpiece! We actually designed much of the home ourselves, so we enjoy our great room and view of the mountains — everyday — that much more!" "True North is at the top when it comes to quality construction, and they deserve to be there. The precision of their work and attention to details is outstanding — you know what you’re getting with True North." "We enjoyed the building experience with True North because we were involved in the entire process, from the drawings to the finished product. The delivery of our home was like clockwork and it was just thrilling to see the blueprints come to life!" "Ultimately, the knowledgeable staff, their passion for excellence, and the company’s confidence in offering a 25-year “Zero” Air Infiltration Warranty made it clear to me that this was the log home I was searching for. I talked to several companies, but when it came down to it, True North stood out as the best choice." "The whole process working with True North has been quite rewarding. I was able to have my home stained to make it look quite natural, like it's been here for a long time. They were very good about working with me to figure out what sort of design we could put together to get what I needed. We did a very good job. It's been a great experience. I've enjoyed it!"